Do not trust the mainstream media when it comes to news in the crypto universe, because most of them can't even get their facts right. Previously, we've seen how mainstream media outlets screwed up when they reported that South Korea was banning cryptocurrency. The FUD news spread like wildfire, when in fact South Korea has no such intention. A lot of the news have either proven to be completely false, or was blown out of proportion. If you're worried, I'll try to clarify all the FUD here one by one. See the screencaps below. Image credits belong to the respective sites. Earlier this month, mainstream media reported that South Korea was banning Bitcoin and crypto. Their Finance Minister Kim Dong-yeon then stepped out to clarify that the government had no intention to ban or suppress the cryptocurrency market, and that their immediate task was to regulate exchanges by allowing only real-name bank accounts to be used for crypto trading. This rule is to prevent bitcoin and other crypto from being used for money laundering and other crimes - exactly the same as what India is looking into. Yes, hackers did managed to steal $500 million worth of NEM (another crypto), but note how mainstream media blew the whole saga out of proportion, which then triggered panic selling in the markets. But not all the media outlets who reported this hack actually bothered to continue part 2 of the story - that CoinCheck was refunding investors who had lost money in the hack. Why just spread bad news and not the good news? I'll leave you to ponder on that question yourself. 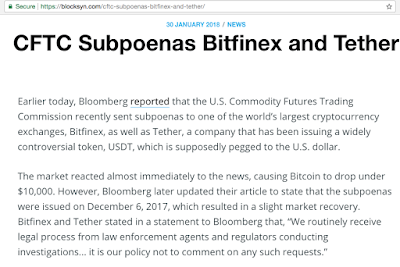 Another round of panic selling was triggered, no thanks to Bloomberg's report that originally stated Bitfinex was recently sent a subpoena. 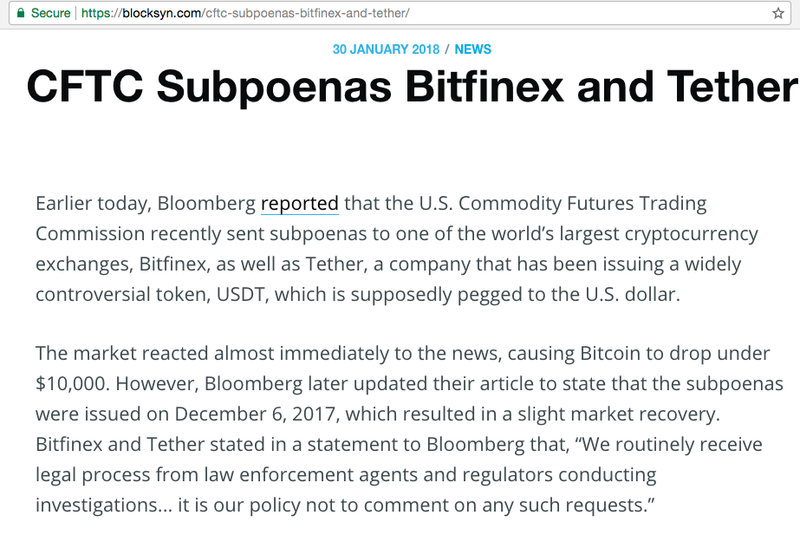 Bloomberg later edited their article to clarify that the subpoena was sent in December. 5. Crypto markets have been artificially inflated by the printing of tether (USDT). Once it crashes, it will wipe out anywhere from 10% to 80% of the crypto market. The total value of tether stands at approximately 2 billion, which is just 4% of the total crypto market cap at time of writing. To say it'll bring the crypto markets down by 80% is just a gross exaggeration. 6. 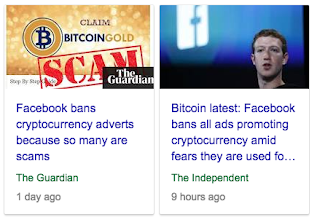 Facebook banning ads on Bitcoin and ICOs. Why get worried when this is a move that should be applauded? There has been a growing number of scam ICOs and fake crypto investment websites that have been advertising on Facebook, which has honestly been riling a lot of investors in the community. In my view, Facebook is doing the right thing by saving their users from falling for such scams. Out of sight, out of mind! If you're scared, then perhaps the crypto markets aren't for you. But while everyone is selling, I'm instead shopping to buy more. What about you? Err.. nope. You seem to very conveniently ignore the first line of the quote - " The Government does not consider Cryptocurrencies as Legal Tender or Coin". That is as clear a declaration as can be that crypto currencies are not considered valid money by the government. Sure, it doesn't mean that they are being 'banned' by the government, BUT, its not trivial that the government has refused (in no uncertain terms) to accord them the same status as legal money. I don't think I have misinterpreted it. All along, crypto has never been considered legal tender in India (neither is it in many other countries) and Arun Jaitley has maintained that stance for a long time, most recently in early December when he reaffirmed that India does not consider crypto legal tender. I repeat, nothing has changed since December until now...except mainstream media headlines. and now 1 Feb the same stance has become "INDIA BANS BITCOIN"
An outright ban on crypto per se and a ban on crypto being used to fund illegal activities are completely different. Regulations control the usage of crypto whereas a ban outlaws it entirely.